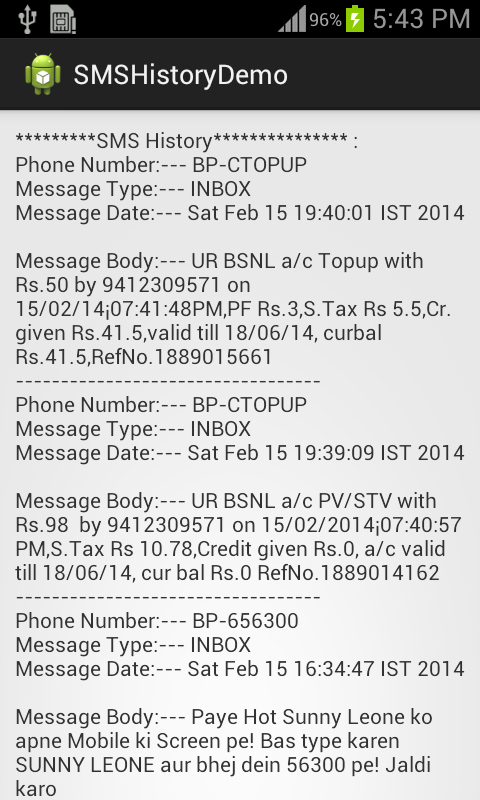 This is a very simple demo application for Read SMS log in Android phone. All codes are below copy paste and enjoy. stringBuffer.append("\nPhone Number:--- " + number + " \nMessage Type:--- "
will this be generating sms logs each and every time an sms is received? yes if you will go through application it will so latest history. i want to fetch the all call log in my sd card as a backup & restore it. so help me. in sd-card? I don't think it is possible. Instead of sd-card sync on server and save in database and if needed restore it from there. very nice tutorial but i need some help..
Can you please share log cat here? Your log cat shows that you are trying to getting call history in main thread that's why your app got crash. May be it happen just because of long time task doing in Main Thread so use Asynck task.May be it will help you. Just put your method inside background thread and onPostExcuite method display the data in list. Its seems you need to use async task to get history.. Thank you so much for your code. It's really useful to start. I want to get name of the contact number if i save in the contact book. but i tried with some other code, can you help with some code, it may be helpful. Thank you so much in advance. 1)You are using real device not emulator. DO UI thing inside onPosetExcute. Like display the list of sms history etc. If I m importing ur code it works properly but if I code that into my code it having error like unfortunately stoped....!!! Can you share your error log? I hope it is some permission issue inside your manifest file. thanks. is there any example for getting internet data usage ?